About 12 years ago I realized that wine gave me a nasty headache. Not just red wine – ALL wine. I really enjoyed wine and especially learning about wine. But these headaches, were awful. Ibuprofen would not give any relief. So, I stopped drinking wine. No sense in torturing yourself, right? I happened to be searching for information on Red Wine Headache and came across a Wikipedia article about it. What I learned from doing some research into red wine headache, is that it is most likely a histamine reaction, rather than a sulfite or tannic reaction. So for this experiment I decided to see if Claritin, loratadine 5mg, would be enough to prevent red wine headache. Benadryl would probably also work, but diphenhydramine will put me right to sleep. Combining that with alcohol seemed like a bad idea. So I decided to try these Claritin reditabs. I also chose wines that were known to be tannic or with sulfites. 1 Chateau de Bon Ami, Bordeaux 2009 (tannic) 1 reditab, 5mg. Taken about 30 minutes prior to first sip. Smooth, not too much tannin.Very drinkable! 2 glasses of wine and no headache. 2 Paul Jaboulet Parallel “45” Côtes du Rhone 2009 (tannic) 1 reditab, 5mg. Taken right before first sip. This wine is much more tannic and dry. Not bad, but would have been more appropriate to have with dinner. 2 glasses of wine, 1 glass 3 hours later. No headache. 3 Barton & Guestier Rosé D’Anjou 2010 (sulfites) 1 reditab, 5mg. Taken right before first sip. Sweet and smooth. Not very dry. Really enjoyed this one. 2 glasses of wine, 1 glass 3 hours later. No headache. 5 Briccotondo Barbera 2009 (supposedly less tannic) Took the reditab, 5mg, after about 1/2 glass of wine. I didn’t enjoy this wine at all. 1 glass. Noticable fatigue within 15 minutes. Dull headache within 2 hours. 7 Chateau de Bon Ami, Bordeaux 2009 (tannic) Took the reditab, 5mg, after about 1/2 glass of wine. This bottle tasted different to me than the first. It tasted much more tannic. I did not enjoy it as much. 2 glasses. Again, noticable fatigue, flushed cheeks. Dull headache within two hours. Wondering if Claritin affects the palate. 9 Chateau Les Mondons Bordeaux 2009 (sulfites & tannins) 1 reditab, 5mg. Taken right before first sip. I didn’t enjoy this as much as the Bon Ami Bordeaux.But was still good. Felt a bit more tannic, more bitter and dry. 2 glasses. No headache, no fatigue. 10 Chateau de Trinquevedel Tavel Rosé (sulfites) 1 reditab, 5mg. Taken right before first sip. Much dryer than the Barton & Geustier. Still a nice fruity finsh. 2 glasses, no headache or fatigue. 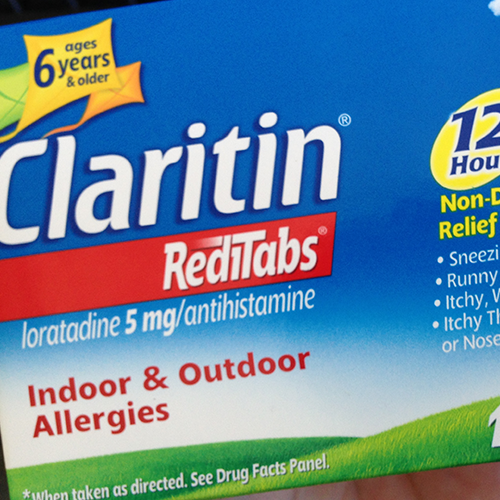 It seems that for me at least, there is a histamine reaction that the Claritin does help prevent. However, similar to my lactose intolerance and lactaid, the anti-histamine needs to be taken before the the first sip. There must be enough of an instant reaction to cause a headache (and fatigue). I honestly had not considered the fatigue effect of wine, but it was certainly noticeable. I believe that prior to this, I just had always assumed that as a depressant, wine makes you sleepy. It must be the first part of the reaction. The reditabs are nice because they don’t need to be taken with water and are fast acting. They will travel well in a wallet or purse. The drawback is that they are not inexpensive; they are basically a dollar a tab. Because of this, wine will not be part of my daily life. However, it is nice to know that wine can be part of my life again – in moderation, of course. I may give that Barbera another chance with Claritn. I’m curious to see if Claritin changes the taste of wine, or rather if the histamine reaction is what makes wine taste off. I mean, it’s for science right?